Money Back if it isn’t a TV? Note that the TV licence is not about a TV per-se, but about an overall apparatus that can be more than one box (i.e. tuner box + monitor box), but since 1936 or so the universally accepted definition of a Television is display of video and Sound sound via demodulation of an RF Signal from an aerial using an integral tuner. Since about the same time the universal definition of a “Monitor” is a display (sound is optional connection) that takes un-modulated “baseband” video without any RF tuner, directly. No need to confuse TV sets with TV licences. Not the same thing. A Digital TV is designed that the aerial receives a Terrestrial signal feeds an RF tuner, the analogue output (baseband) from the tuner is digitised and decoded to give the video display and sound output. The only difference from Analogue TV to Digital TV is that the Analogue Modulation and the Terrestrial Radio signal represents digital data and not analogue brightness levels. 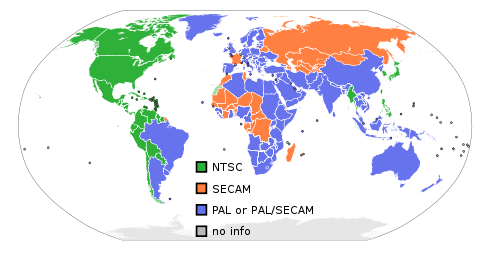 There are basically two main incompatible types of SECAM, Two main kinds of PAL (sub types of PAL have incompatible sound), and one main kind of NTSC. All of these use a separated added Colour analogue signal to what was originally a 625 line (576 digital is same visible lines) or a 525 line (480 visible) Monochrome signal. Only TVs compatible with PAL-I where sold in Ireland via Retail. Later some added extra compatibility such as NTSC, SECAM or PAL B/G. No one would have expected to sell a TV set without PAL-I, as that is implied by selling a TV set in Ireland. Note that NO monitor uses PAL-I, even if it’s PAL Composite. Some unscrupulous retailers in Ireland did sell some UK market PAL-I sets which had no UHF tuner. They always refunded/replaced if there was a complaint. Originally Argos would not sell UHF only TVs or Aerials here. Sale of Goods Act and Common sense applied. The Hybrid Analogue Digital never used Terrestrially, only on Satellite. So what does that mean (link)? It means your TV needs to be a Digital TV. For a while most Digital TVs will also have Analogue Tuners. It doesn’t need to have a Satellite or Cable Tuner. These are regarded as extra services, not part of basic definition of a TV, which is moving picture (video) and sound (audio) received via an Aerial. Already all of Netherlands, Berlin, Main USA NTSC, all Wales and I.O.M. and other places have turned off Analogue Terrestrial TV. 1. Signal is received via the Aerial and integral RF tuner. Just like Analogue. 3. 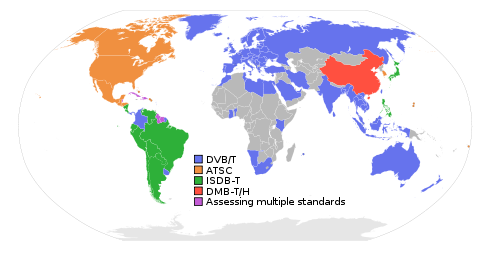 The DVB-T flavour must include MPEG4, not just MPEG2 video and AAC+, not just MP2 audio and MHEG5, not just basic DVB information. Just like PAL-I and a VHF /UHF tuner was implied by an Analogue TV sale. The UK market packaging always has Freeview Logo and/or word. This is separate from Digital. This is one of two UK services. This means it has the MHEG5 needed for Ireland. Very occasionally mentions MPEG2. Rarely mentions MPEG4 even if the TV does it. Non-HD UK Freeview Digital. Most Products are not compatible, but some are (list at your own risk). Certified compatible with Irish Digital TV. Non-certified TVs might be 100% compatible, even some Freeview ones, but how can ordinary consumer know? The government warned people and CEDA warned Retailer and Manufacturers in February 2008 about labelling. 1) Simply putting a label Analogue Only in Ireland is fine. 2) Labelling it Incompatible with Irish Digital is fine. 3) Labelling it May be compatible with Irish Digital (because it has MPEG4) is fine. 4) Leaving the labelling on packaging “as is” implies it’s a Digital TV for Ireland. Because unless there is a disclaimer that it has no MPEG4, then “freeview” (indicates needed MHEG5), Digital tick (Indicated correct tuner) etc are correct and sale in Irish Retail implies MPEG4, like Analogue PAL sales in Ireland implied PAL-I. In the Sale of Goods Act, there is clear Refund, Repair or Replacement if the unit is not fit for use or of merchantable quality. The Package Description specifically is mentioned in the act as defining the Contract between Retailer and Customer as to the Use, so as warned by Government and CEDA the Retailers needed to amend the labelling. There was no onus to sell compatible TVs. Only to not mislead about what they actually selling. Why did no retailer anywhere to my knowledge amend the labelling? A phone call or fax quickly establishes which (ever increasing from late 2008) Models are compatible or not to slap appropriate labels. Could it be that the Retail trade assumed that would hurt sales of incompatible models and they thought they would get less than 10% complaints/returns anyway due to 80% used as Monitors and few people knowing consumer rights? They didn’t break the law. As long as they sort out people that are firm about replacement/refund they are not breaking any law. But it’s a travesty to suggest this is not covered by the Act and it shows how poor Consumer protection and Publicity is that nothing whatsoever was done or is being done about the labelling of Retail stock in Ireland. It’s a separate bizarre issue as to why the “public” information campaign didn’t start in Mid 2008 and is only due to start end of February 2011, elections permitting. See Saortv.info news. Partly that is due to DCNER/Government/BCI/BAI wanting to “hold back” Public Service DTT information and Rollout till search for someone to take up Pay DTT licence was exhausted. No one is claiming the Retailers had to sell compatible TVs in 2008 to 2010. No one is claiming the Retailers broke any law then or now. But if they ARE selling a TV that says Digital on it, they are obliged to sort out complaining customers if the “Digital” doesn’t work. A “no Freeview” disclaimer is irrelevant as that is just one of two UK services on DVB-T (Digital) and wasn’t even on UK DTT originally. Saorview is even really the same name! Again the Government has fallen down on the job. Minister Ryan should have signed an SI or whatever as provisioned by the Broadcasting Act to set the ASO date back probably in August 2010. RTE assumes, and Ryan has said (but not signed to law) Q4 2012. November 2012 has been Mentioned. N.I. ASO plan has not been published because they want / need to co-ordinate with Ireland. But Ireland despite “mentioning” November 2012 and q4 2012 has not signed anything. The UK in previous ASO by area avoids a switch off between November and January, so 31th October/1st November 2012 makes sense. Any Retailer with any sense ought since December (before Christmas rush) have had prominent notices warning that all Analogue Only TVs will only be SCART or HDMI monitors (no Aerial signal) after Q4 2012. Argos are verbally warning customers. Why is no Retailer doing this yet? Too many incompatible Digital TVs they hope to get less than 10% returns on? Meanwhile my recommendation stands. Print pages from the Sale of Goods Act. If you didn’t buy the TV in last month or so have a good explanation as to why you left it so long to complain. (didn’t know service had started, so had not done a Digital Scan would be true for most. After all the Publicity doesn’t start for over a month yet!) print RTE Saorview pages and saortv.info pages. Be firm and polite. You need proof of purchase but not package. The retailer will likely refund or replace. It’s worth going to Small Claims Court if they don’t. * DID electrical – Replace TV bought several months ago this week. Unusually Video Worked, but no MHEG5. MHEG5 unlike Teletext isn’t optional for compatibility. All “Freeview” and “Freeview HD” sets do MHEG5. * Aldi – 3rd Nov 2010: Refund on 2009 sale. * Tesco: After 28 days they never replace/refund without call to HQ. HQ usually authorise refund. You need to insist that they ask HQ. The longer you leave it past November 2010, the harder it will be to explain your case, even though the time limitations for “Damages” under the Sale of Goods Act is 6 years. The NCA site explains this too. A Black List of known “bad” boxes. If you bought any of these online advertised for “Irish Digital”, or in Ireland (without a disclaimer that it’s incompatible) , then you have a very good chance of refund. You are entitled to it. Link to Saorview Resource site with links to other important Saorview sites. Three has only 3x 5MHz Channels @ 2100MHz. Each sector on a Mast uses one. The aerials and channels on Sectors on Masts are aligned so sectors don’t interfere with other sectors on the three surrounding masts or on the other sectors. Many people may be in the three areas adjacent to mast where two sectors overlap somewhat (to avoid holes in coverage and increase capacity) or where different sector channels of two masts overlap. Repeaters are not meant to be used WHATSOEVER in weak signal (which is likely where channels from different masts overlap). Repeaters are ONLY meant to be used where the indoor part doesn’t leak RF to outdoors and indoors can’t pickup outdoor signals (like tunnels, Metal buildings with no windows and underground car parks). Three are irresponsible using repeaters rather than a Router (which costs less) on Doemestic houses. It will almost always damage reception in the immediate area if the indoor part signal leaks out. Why do they use Repeaters rather than Routers? * Routers don’t work with phones for 3G voice calls, ever. Repeaters work with phones. * Three make no money from Data. They hope to make money from 3G voice. Three have ONLY 3 x 5Mhz channels for all mast sectors in the entire Country. You will ALWAYS get very much better performance and have more flexibility and a firewall if you use a decent router and turn off the Repeater. Repeaters can only be installed by 3G licence holder, but their licence ought to forbid misuse of them. Infact if the Repeater interferes with the other 3 phone companies it is illegal.